Ergonomics is an important consideration because there is not one single size or configuration that suits every individual. Body height and weight varies greatly from one person to another; so while one configuration might work with one person, it won’t necessarily work for anyone else. A customizable feature for office equipment and furniture makes sure that it can be configured and adjusted to the individual requirements of each user. Ergonomics is a vital part of various office equipment such as tables, computer monitors, mouse, keyboard, and many more. The one component that should be the initial focus of any ergonomic effort is the chair, as it establishes the seated position of the individual using it. Without ergonomic features, it would be difficult to be comfortable and efficient even with all components correctly configured and in place. An ergonomic chair is the foundation for everything else in the work area. Office employees spend most working time behind a desk; throughout that time, body weight is supported by that one piece of furniture. Without the effect of ergonomics, it would be uncomfortable and even painful to sit on one that had not been adjusted specifically for the user. This could lead to distractions at work, poor efficiency and painful back problems in the long run. Using an ergonomic chair allows a user to fine tune it according to individual physical attributes to avoid any discomforts and problems resulting from extended sitting. Such features may not show benefits on a short term basis; however, for employees who spend the entire day sitting, the benefits can be impressive. So how is the right ergonomic chair found? There are several key areas that should be considered based on a chair’s capability to be measured and sized to the individual proportions of each user. Height – The height should be easily adjustable to allow for the body length differences of each different user. Most office desk heights are constant, so an adjustable chair ensures that the desk is neither too high or too low for a particular user. 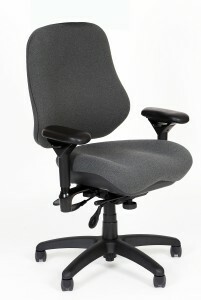 Back Rest – The back rest must also be adjustable to accommodate a user’s ideal body position. The back rest should be able to accommodate back height, forward leaning and backward leaning. This ensures that the body’s distance from the table remains within an efficient and comfortable range. Seat Depth – The seat depth should ideally be the length of the thigh for average users, which is determined by the measurement from the seat back to the edge of the seat. The depth should be neither too short that the user is barely sitting on the sear or so long that a user has to slouch to reach the back support. Ergonomics should begin with the chair in an office setup because it is the one piece of furniture that supports a user’s body for majority of the time spent at work. Good body support prevents discomfort, body strain and even back issues. So be sure to let the starting point for any ergonomic office that important chair – and hopefully allow for great comfort while working! Let the Ergonomic Chairs Store Supply Your Ergonomic Chairs! Do you know how important an ergonomic chair can be? Call the Ergonomic Chairs Store at 979-217-3044 for help in finding the right office chair for your workers! By Ergonomic Chairs||Uncategorized|Comments Off on Let Ergonomic Chairs Help Seat Your Workers!